As always, Manhattan Review India (MR) innovates its products and services to meet the needs of our students. Among the most important requirement for many of our students is an ‘Assured Admission’ in American universities. With an admit on hand, students can breathe easy and work on their visa process. This is exactly where MR has scored over other consultants. 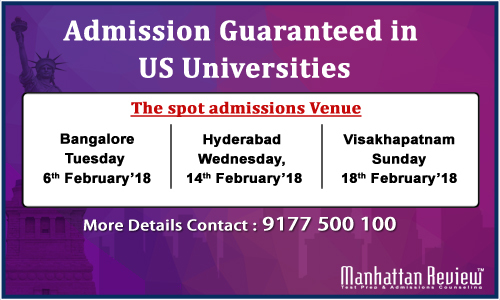 We now offer a Guaranteed Admission Service for admission in US universities. In almost any program and for any profile (of course, subject to a few minimum parameters), we offer at least one I-20 for Fall 2018 intake. How do we make sure that our students get an admission without fail? We work with hundreds of universities throughout USA and are aware of their admission requirements. We will match the students’ background with the universities requirements. And, we will take utmost care to see that the admission process, documentation and timelines are meticulously followed. When hard work also becomes ‘smart’, the results are bound to come! Manhattan Review makes sure that each and every one of our students is successful in their efforts of studying abroad, especially in USA. Contact any of our centers nearest to you. Our counselors will explain our exciting package which is being offered at a very low price. The unbeatable combination of guaranteed admission at a very low cost is sure a WINNER. Come, join the bandwagon of students who are ready to go for USA in the next six months! Meet our counselors in of the centers located in the above cities and register your names as soon as possible for the ‘Spot Admission’ event. Have a successful and dream-fulfilling 2018.